The far southern reaches of the Americas protrude beyond any landmasses in their stretch toward Antarctica; winds remain unhindered while lapping the globe accruing force and moisture for delivery to the Southern Andes. Bad weather the unfortunate norm; Why visit Patagonia, you ask? I believe Tres Torres & the Fitzroy massif some of the planet's finest peaks, steep, aesthetic and unhindered by thin air: If life is truly a collection of moments then the brief vivid en route and summit views from here go straight to the bank. A child grazing paper with pencil depicting a Mountain could easily conjure a steep sided Dr Seuss style Cerro Torre likeness? The perfect Mountain! 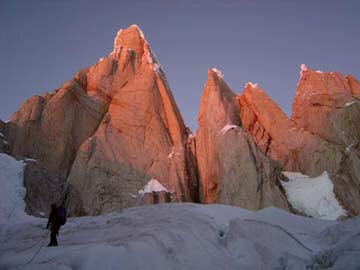 Unique snow formation grace the summit, huge mushrooms resulting from cool air traversing across a large ice-cap then meeting warm Pampa air on the ridge-line created by Cerro Torre, Torre Egger and Cerro Standhardt: The frosting on the three towers isn't matched across valley, Fitzroy, Poincenot, Raphael, Exupery & De l' S offer dry routes without extensive mixed climbing. For me the fickle elusive nature of the Torres' adds appeal; if the weather is good sneak up try not to get noticed should the peaks become shy & quickly redraw their weather shroud. From an expedition standpoint it is quick access super Alpine terrain, town is close enough to re-supply and boulders are plentiful with many lying just beyond the blowing rain veil. Plenty to do, specially the ability to leave weather behind (sometimes) and certainly not the type of venue where mandatory tent sitting slowly stirs one's mind. 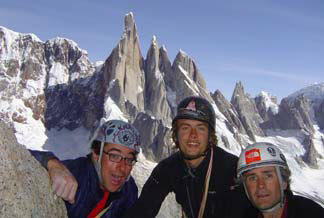 Our goal for the Southern Hemisphere's summer '04 season was to unmask controversy shrouding an ascent claimed on Cerro Torre's North Face in 1959: I, Leo Houlding & Cedar Wright basically just wanted adventure from the Alpine style challenge posed by their stated route. The story is thus: Maestri & Toni Egger climbed crack systems via a snow patch (lower E face) then tangented rightwards to the Col of Conquest via a crack and ramp-line. The actual North Face he reported to have been entirely ice coated, allowing easier passage with the crux being a section below the col, on the East side. A party climbed Torre Egger ascending to the Col of Conquest in similar fashion, some ropes and pieces were discovered but quite low down. Pitches directly beneath the col proved technically easy via a hidden ramp: Contrary to the Italian’s tale dissent formed and his claim was questioned. 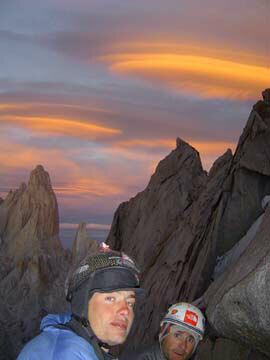 Maestri stumbled alone from the base of his claim with Toni Egger having been swept by avalanche with the camera. The ice glazed upper section was claimed prior to the use of twin ice axes; one shoddy long handled axe and a dagger was the era’s mode. 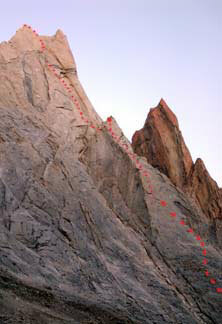 True evidence, Maestri says, is in a drilled rappel route down the left (East) side of the North face plus occasional belay bolts en their ascent route. The face has seen few attempts with only one team making serious progress beyond the col. None have found evidence of bolts and none have succeeded on one of the ultimate Alpine prizes. Reports of a long weather window trickled out of the mountains as we arrived in Southern Argentina; movement became exaggeratedly rushed in eagerness to see blue skies over the Torre, though realistically there isn't a way to speed overland transit. Clouds unfortunately matched our bus' speed while trundling the dirt road towards El Chalten, offered a brief teasing glimpse before shutting the window. Basecamp is two hours (six miles) above the rustic yet rapidly developing town; situated at the head of the Torres valley, immediately below a lake wrung from the glacier's snout. Its dam is the prior terminal moraine and protects camp from wind, glacial melt providing mineral rich drinking water straight from the river. An idyllic setting with an added bonus of a climber built cabana, a cook and hangout zone during shoddy weather also forming a multi-national social hub. Rush, rush straight to the climb's base. One night in Chalten and one night in the pleasant setting of basecamp, quick re-pack to set the scene for an immediate foray up the glacial valley. Barometric pressure is the oracle for Patagonian weather a slow rise results in a slow descent so if the peak is high enough weather should hold, (if it takes several days to become fine it ideally will take the same time to regress) indication swayed to brighter skies. No lingering in Campamentto D'Agostini (aka Bridwell): A tyrolean begins the approach spanning 150 ft across the boiling river-mouth ten yards downstream from its birth, Laguna Torre. Steep trails enter the woods above the Laguna gaining elevation to avoid cliffs only to loose it again down to the glacier's tongue. Temperature at elevation can be assessed while descending toward the glacier. Gauge comes in the form of a stream/waterfall crossing; heavy rain or warm temperatures form a raging torrent offering daunting, insecure passage. A quick boat ride across the Laguna would negate most of the elevation gain, we even had a quick look in Buenos Aires but not really time enough to find anything but Disney dinghies. The valley is forged by three glaciers and several hanging ones, all are dry (bare ice, visible crevasses) and all flow to the same outlet but each has unique character specially to travel upon. The first spills from an impressively extensive ice-fall down the eastern slope of Cerro Adela, re-compressing at the slopes base for its final flow to the Lake. The primary glacier is circuitous to navigate, heavily crevassed if one ventures the Wrong way. 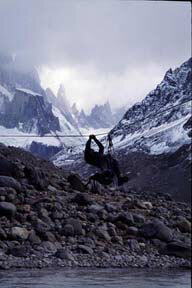 Highlight of the first crossing is undoubtedly the climber dubbed "Rio de la Muerte", River of Death sometimes a life changing leap, sometimes a neat 'trekking pole' vault. Watercourses on the glacier's surface channel into this one stream that looks like the ultimate Water-Park ride, a deep (15ft) canyon of fast flowing, high volume, very cold water; eventually depositing into a dark cavernous hole at least half a mile from the snout: Hence the name. This season it proved a non event, I while chuckling to myself remembered my first crossing, donning crampons and launching with ice axe in-hand toward no particular landing pad: Luckily a better crossing point was mentioned before a second venture. 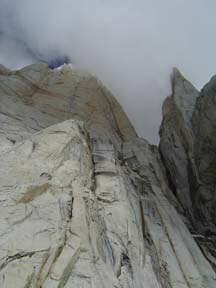 Glacier number two flows from under the 'gob-smacking' 5000+ ft South face of Cerro Torre, the perfect mountain. A smattering of rocks coats its surface opening the way for quicker strides until a final gash hopping section gains access to the moraine created by the third and final frozen flow. A flat sandy wash hovers beyond this moraine (gravel hills) a beach amid mountains, sandwiched between Poincenot and El Mocho (the Torre's footstool), surrounded by tall needles it's the turning point for peak choice: Up and left for Cerro Torre, Egger & Standhardt or right for Poincenot, Raphael, Exupery & De l' S.
There is no real outlet from the valley; it ends in a cascading cirque. High camp's accommodation is provided by hospitable boulder caves Polakos (Polish bivi) lies in a sandy boulder strewn valley/ditch below Poincenot. Our bivi of intent Norwegos (Norwegian) lay a further hour (2000ft) up loose talus directly below Media Luna and the tongue of the snowy glacier guarding the three towers. Steep gravel relinquishes the sole flat-spot to a collection of large boulders, over seasons of high wind and rain their users have been forced to further excavate caves and fabricate walls: Quite homely when not churning in cloud. Our first morning in Norwegos brought murk and drizzle with threatening skies, the Barometer bumped up and down so we recouped, festered and fed away our first real 'rest' day. Early evening saw the barometer raise again, a strange bumpy graph but positive never-the-less. Exiting Norwegos for the climb requires spiky feet and umbilical attached team mates. Snow hides the gaping holes of the Torres glacier rather admirably; large bridges and heavily sloughed areas are inevitable. Early morning is preferred transit time, it's much better to be riding atop the crisp frozen snow wearing crampons than dragging heavy feet out of trenches after the sun has churned the surface. An hour and a half of marching sees one at the beginning of technical climbing. The Maestri/Egger cracks straight out of the ice negotiate the bergschrund's gap and you’re on it. A climb of two distinct characters on two separate facets of the mountain: Two thousand, plus feet on the east face into the Col of Conquest between the north face and Torre Egger then a similar more technical length on the north face. Skies remained clear as we hovered at the base with Barometric pressure plummeting rapidly, always a bad sign in this region, wavering our psyche to the point where we waited to see what would happen? Something tangible became necessary before movement up or down would initiate: Clouds split against the backside (West face) of Cerro Torre and began to boil into the valley we turned and ran all the way to basecamp. Clouds continued spilling into the valley stalled then backed out. 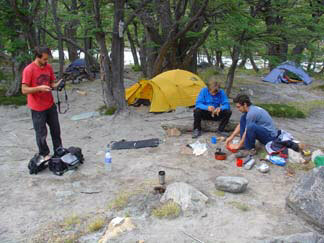 Base to high-camp (Norwegos) is four or five hours under a heavy load, two hours unladen at the very least. 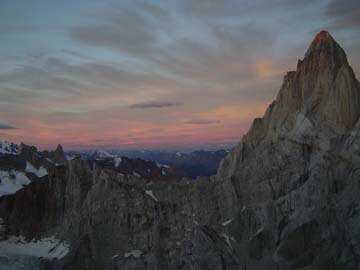 We had arrived back into Campamentto Bridwell under a darkening sky yet within an hour it cleared. Weather was leading us quite a dance not the normal white wall snow/rain or fair. The barometer bobbed up and down as clouds rolled in and out, yet a universal mountain rule seems to be when it’s clear, gotta go. Only a short nights rest then back up to the boulder caves just in time for the clouds to again spit rain & engulf the valley. That night each of the cavernous grottos chosen for sleep leaked considerably and it felt like we were under the landing lights of a bustling airport. Gusts would rip through the valley as if a 747 were grazing within feet of the bivi site, in turn seemingly driving rain straight through the granite. The weather's wavering pattern continued; neither truly horrible nor good, plenty of snow and wind but not quite slipping into full tempest. We remained in Norwegos waiting again for the tangible indicator; it certainly wasn't climbing weather but neither did it ferociously drive us out. Day three in the cave was my break-point, there wasn't enough room to sit up, one's feet were jammed into an acute slot severely restricting movement, one person could comfortably lie within but we were three! Attempting to cook without torching sleeping or bivi bags required a huge concerted effort, settling into this scene on morning three it felt to be wearing thin; after caffeine all were ready to don the Gore-Tex and improve comfort levels in basecamp. This can be a frustrating range to climb in, usually a waiting game but this time we were being forced to march up a down valley as if someone were controlling it all from a vantage point and never tiring of the joke. The next time at Norwegos poised to climb; Leo asked. "What's your worst recent moment"? For some strange reason I couldn't conjure any climbing scenarios and remembered a night in Manchester's Musicbox: Good club, great tunes, awesome crowd, I stepped into the toilet's (that's its name in Britain, who's foolin' who we don't rest there?) usual derelict scene, people waiting but a free unit? The vertically oriented, wall mounted individual kind: Relief was mine as I noticed the washed out sign, 'Don't Use!' timed perfectly with the cistern releasing its flush into the whole row. Mines front was broken off, that little lip that prevents the contents being gathered by the flush and ejected onto one's crotch, yes it wasn't there! "What the hell's that got to do with climbing?" Leo blurted back? 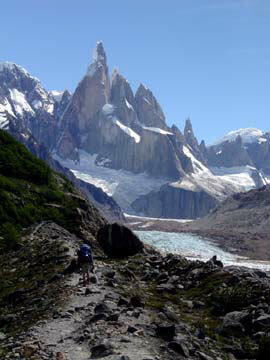 I look across valley at the seracs between Fitzroy and Poincenot, "I remember watching those Seracs fall", I say, First time I came here; we'd just climbed the Torre & Standhardt and were hiking everything back to basecamp. Nowhere in the gully was safe from falling ice, the following visit myself and Alan Mullin descended the same gully after climbing Fitzroy. Guess all I'm saying is a selective memory really helps one be optimistic? Either that or the worst that can happen never quite does and memory flushes these moments in a form of self preservation, if all was considered would ascent still be rational? Here we were poised; weather looking okay, psyched and running through the list of what makes it safe to climb this famously dangerous route in current conditions, everything pieced together, this IS the time! As I subconsciously tallied the perils and quashed each Leo's delivered his question, after all had been rationalised and stepped past? If one cannot asses the dangers inherent in the game, whatever the game may be, it must surely minimise a practitioners playing time? Attempts to awake at three am never came to fruition, alarms were set but nobody accepted accountability. We discovered within the group that setting alarms had no effect unless coffee duty and alarm recognition had been assigned. Think we all awoke at three and tried not to stir should someone comment thus initiating the day: By five we were in motion leaving Norwegos for the Maestri/Egger, round two and this time the glacier hadn't reconsolidated we sank into heavy, wet snow. The previous night had been a virtual fire fall boulders constantly ricochet down the cross-valley gullies causing bright sparks with disturbing regularity. Warm wet weather was causing rapid local evolution. 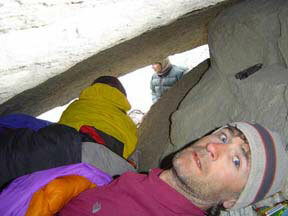 It had favourably stripped our intended climb of almost all the usual overhanging, threatening snow/ice blobs. Unfortunately evolution was still evident as we drew under the East face. Ice blocks and rocks cascaded from all points, small barrages initially; the extra hour in bed looked to have saved our skins! Sun warmed the Tower, its response was to find larger chunks to cast down with increased vigour. Had we arose at three we'd have been a pitch or two up without the ability to dodge what became a constant barrage. Nowhere on the route was proving safe from missiles, even saw sloughs from the Torre's North face leap to the Egger and rebound with more debris into the col. Spectacular but unapproachable! 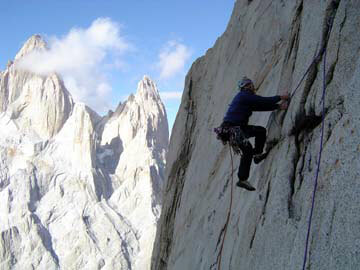 I was steered by compadres into repeating the Compressor route, Cerro Torre's South East arête, frankly little else was safe. Climbing begins in the same glacial cirque, usually via a steep snow slope to a single pitch of mixed climbing, this season the warm conditions had collapsed the entire snow slope requiring one to stay only on rock. Seven 60m pitches a 5.9 move or two but never sustained. 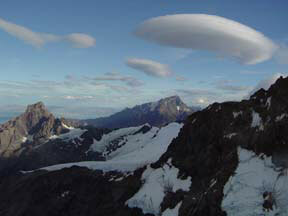 The shoulder drew closer as cloud did the same around the Torre's summit. 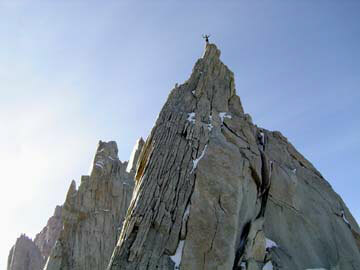 Plan 'C' dropped into effect a small spire east of the shoulder an unclimbed Patagonian summit! The Compressor route takes off up the spectacular soaring arête/ridge and was already engulfed: A single 5.10 pitch and a ridge traverse attained our fresh summit "Cerro Pereyra", named in memory of a good mutual friend who died while climbing in Mexico. Rain then flushed us from the high-camp's caves and remained in-situ; town ventures became more frequent we started accruing boulder problems in Madsen camp and hiking back and forth for further bonsai projects and rain avoidance. The camp's cabana is a sweet hang out but does drip after time. Climatic conditions looked to be firmly enforcing their normal mode, debate about gear retrieval became choice topic. 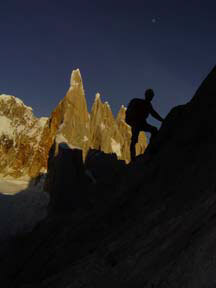 Town became lean of climbers and after a week we were solely left holding the torch for summit desires. Newly delivered internet connection proved a useful tool in predicting weather and right before leaving the vigil was fruitful: A small high pressure system was bumped south for just long enough to poach an ascent. Cerro Torre and Fitzroy remained under their rime ice cloaks so we picked a more rapidly achievable objective in Aguja de l' S' West face. Shortest summit on the West facing side of the valley yet one of the longer climbs due to its technicalities beginning at glacier level instead of threshing 3000ft up a loose gully to the first pitch. A truly enjoyable loooong moderate route and first ascent of the four thousand+ foot (1200m) face, "The Thaw's not Houlding Wright" V 5.10. First section of climbing is a ridge/arête of perfect rock formed on the left side of a larger buttress: We kept ropes in the packs and free-soloed up to the upper headwall. 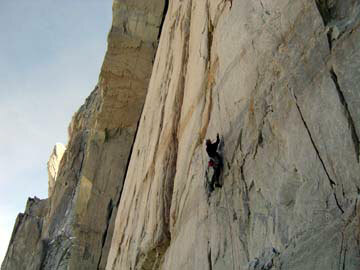 Some of the finest easy climbing ever! The highlight was a short 5.6 arête; lay-backing the square-cut, low angle edge was the mode, all with an admirable view of the glacier a couple of thousand feet below. The testy looking upper headwall relinquished passage via a series of thin cracks just to the left of the main feature, a long rust streak, never desperate, fun high quality rock climbing with a 5.10 section or two per pitch; requiring ten stretched 60m pitches. Upon mounting the summit we saw the true summit, in turn traversed a fine ridge encompassing both high-points then rappelled the North side of our second summit onto a plateau (Aguja De l' S West face topo). 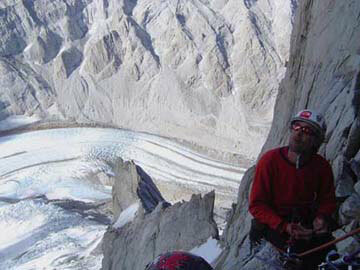 One further rappel accessed St Exupery's gully and rope-work was finalised. Satisfaction from a steep journey absorbed in the expedition's dwindling hours! Fuel for the fire, not the main prize but more moments for the bank and Jose Luis Pereyra's impression on us all will reside with his name on a Southern Andean tower.